Features a print and actual cells of film from Harry Potter and the Deathly Hallows Part 2. 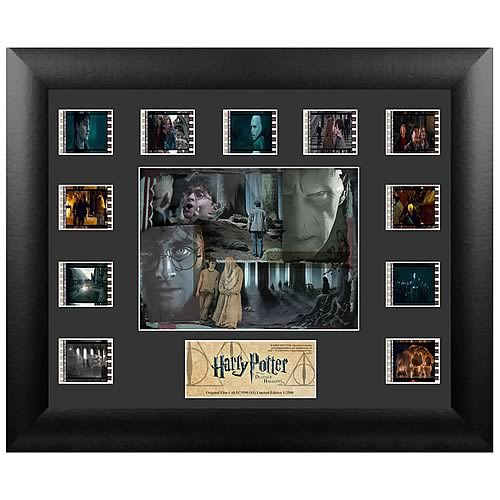 This amazing Series 1 mini montage film cell features a print and actual cells from Harry Potter and the Deathly Hallows Part 2. It measures 13-inches wide x 11-inches tall. Perfect for displaying in your home or at the office, all the elements are framed in black wood and include a certificate of authenticity. Limited to 2,500 pieces. Order yours today! Harry Potter and the Deathly Hallows Part 2 is the final adventure in the Harry Potter film series. In the epic finale, the battle between the good and evil forces of the wizarding world escalates into an all-out war. The stakes have never been higher and no one is safe, but it is Harry Potter who may be called upon to make the ultimate sacrifice as he draws closer to the climactic showdown with Lord Voldemort!